We've been trying for over two years but local angler Carl Schroeder finally landed his first tarpon. This was a baby fish, just around ten pounds, but it jumped like crazy, ran under and around the boat several times, and basically gave us a great fight. It also held still long enough for this perfect photo. I rarely bring tarpon into the boat since it's actually illegal if the fish is over 40 inches long. It's also tough on the fish after a stressful fight and hurts their chance of recovery in the hot summer water. I just wrote an article on this subject for this month's Nautical Mile newspaper. I broke my rule for this tarpon since it was only 36 inches long and legal to pull out of the water. We also used 30# braid and had the fish in my rubberized net very quickly. I had my camera on the cooler and ready to go and the tarpon was back in the water about twenty seconds after it came out of the net. 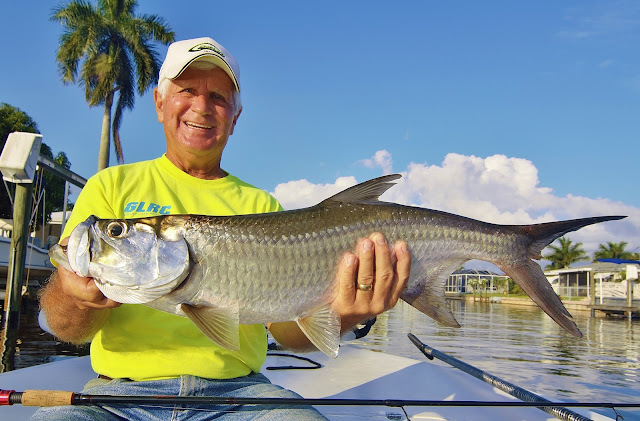 Since this was Carl's first tarpon he deserved a photo and the look on his face is worth it. He also caught a second fish a few minutes later and we popped that one off boat side like I prefer to do with this species.